SoilModels has been around for 10 years now. Though we found the project succesfull in disseminating advanced material models in geotechnical engineering, we still see it is often difficult to propagate them into daily geotechnical practice. It seems that availablility of the model implementations does not guarantee their practical success, as proper application of these models still requires advanced expertise, which is often not available to geotechnical companies. We have thus decided to completely re-design the web and move it to the newly acquired domain soilmodels.com. It keeps its original purpose of sharing soil mechanical model implementations. In addition, it now aims to become a platform to connect advanced geotechnical professionals, which can be searched and contacted by practicing companies who need support with advanced geotechnical modelling. Attached is the last screenshot of the previous soilmodels.info indicating 28282 user visits in the period 2007-2017. 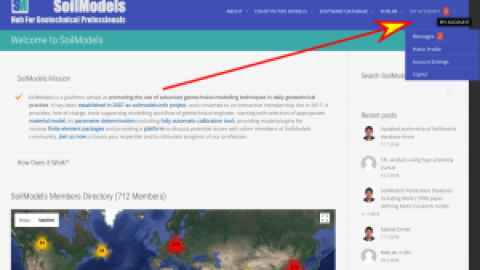 Together with my colleagues serving as SoilModels coordinators we hope the new site will be at least as successful as the original one and it will stimulate progress in our profession. Datasets now available at SoilModels! Professor David Masin, congratulations! I truly respect this project!